The cuisine of Morocco is rich and varied, from classic stuffed pastries like pastilla to sweet-and-savory tagines of lamb, veal, or chicken, to heaped mounds of its iconic couscous. Travel along with author and culinary journalist Jeff Koehler as he explores the food traditions of this North African country and shares the diverse and boldly flavored recipes he found along the way. 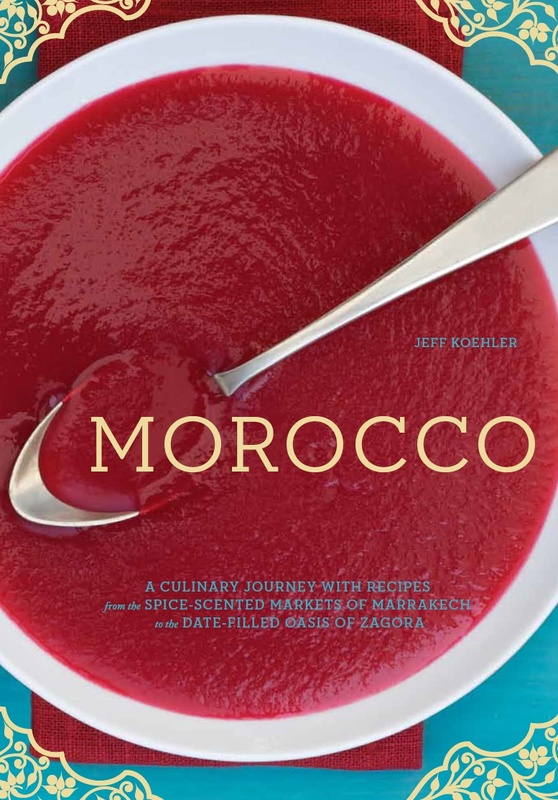 In Morocco: A Culinary Journey with Recipes, author Jeff Koehler reveals the landscape and culinary history, the ingredients, and the flavorful dishes that define this intriguing and ancient nation. The 80 recipes here reflect his wide-ranging travels throughout the country, which led him to such diverse areas as the Rif Mountains and the High Atlas, coastal Asilah and Safi, the date-filled oasis of Zagora and the culinary capitals of Fès and Marrakech, the pre-Saharan market towns of Tiznit and Tan Tan, and into the deep south where the desert meets the sea. Moroccan cuisine has it all, from rustic Berber cooking to the Spanish influences in the far north, from the dizzyingly complex flavors worthy of a palace kitchen to the more straightforward ones of the desert regions, from humble tagines to dishes calling for a dozen ingredients. The food is rich and sensual, colorful, sophisticated, and always artfully presented. Try velvety-smooth Harira, an herby, tomato-based soup that traditionally breaks the fast at Ramadan. Or one of an array of fresh and cooked salads, such as Zaâlouk, with eggplant, tomato, and garlic, or chilled, sweet Carrots and Cumin. Salty-Sweet Glazed Lamb with Almonds and Raisins is served at religious feasts like Eid al-Adha, while Chicken Tagine with Caramelized Tomato Compote topped with toasted almonds and sesame seeds is enjoyed anytime. Try your hand at preparing couscous with a honeyed onion and raisin topping called tfaya or cooking savory street cart treats like Potato Fritters, boldly spiced with cumin, turmeric, garlic, cilantro, and perhaps some hot pepper flakes. There is plenty of fish and shellfish to be had, including Grilled Atlas Trout Stuffed with Grated Carrots and Fresh Bay Leaves and Spicy Shrimp Tagine. Sweets include Oranges with Orange Flower Water and Cinnamon and Double-Baked Anise and Sesame Seed Cookies. And, of course, mint tea. Moroccan cooks blend spices with finesse and use a generous hand with fresh herbs. Add to that a long tradition of vegetable dishes, falling-off-the-bone meats with a harmonious blending of sweet and savory, abundant seafood, and a complex history of sweets, and you’ll discover a North African kitchen accessible to the home cook that not only delights, but surprises and inspires. Read Publisher Weekly’s glowing review of the book here.